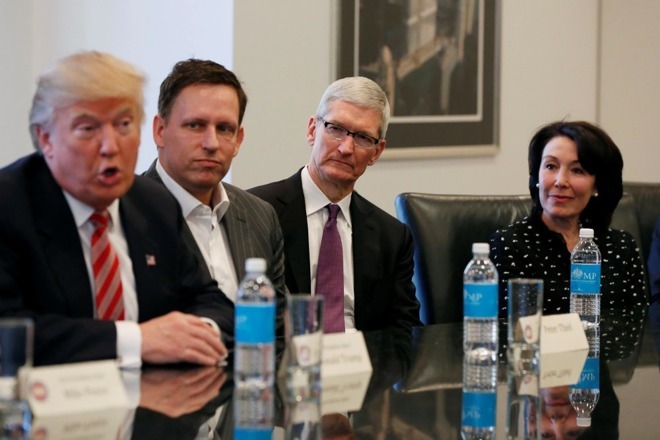 U.S. President Donald Trump says he’s “looking forward” to meeting with Apple CEO Tim Cook at the White House Wednesday. The American president is set to host Cook in the Oval Office a day after Cook attended Trump’s state dinner Tuesday night for French President Emmanuel Macron, reports Bloomberg. The White House has released no guidance on what the meeting is about, but Cook has spoken out on several issues Trump has been dealing with, including his proposed tariffs on billions of dollars worth of goods from China. Cook said in March a trade war needs to be avoided — Apple’s big product, the iPhone, is mostly produced in China. Trump has had a fraught relationship with the electronics company, criticizing Apple on Twitter over its decision not to cooperate with law enforcement on breaching its phone encryption and the size of the screens on iPhones. But Trump has praised the company’s planned investment in the U.S. after the passage of last year’s tax cuts. The private meeting today follows President Trump’s first state dinner last night, which Tim Cook and Apple’s environmental head Lisa Jackson also attended. The state dinner was to honor French president Emmanuel Macron. Besides Cook, other industry titans, including Rupert Murdoch, were at the event.